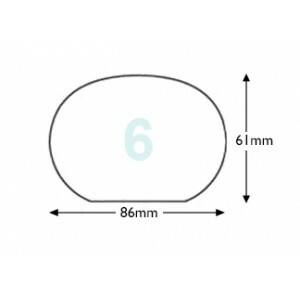 The handrail, profile number 6, is a well turned, rounded shape with a flat bottom. It is a simple style of handrail design that will produce a smooth handrail, with clean lines that would suit any balustrade, for stairs and landing. Options for these handrails include the choice of timbers they can be made from. These handrails can be made with Sapele, Hemlock, Southern Yellow Pine, Pine, US White Oak or US White Ash. You can also have a choice of lengths, 2.4m, 3.6m, or 4.2m, and options for no slots or slots up to 41mm, to accommodate balusters that are a bit larger, ideal for larger hallways.